This video shows how to setup and use the WPSyndicator plugin to automatically syndicate your blog posts to 15 social bookmarking sites to get instant backlinks and free traffic whenever you make a post to your blog. I think this is the best film I have seen this year, and Leonardo Dicaprio, who played Cobb, was great in it, as were Joseph Gordon-Levitt (Arthur) and Juno star Ellen Page (Ariadne). Inception starts out a bit confusing, but once the film gets going things are explained and you easily begin to love this film, sitting on the edge of your seat eager to learn more about the weird dream worlds that Cobb and his team can induce. They soon come up with a plan which proves to be a lot tougher to carry through than first thought. Cobb has to face up to his secrets and deal with his guilt, and Ariadne helps him to do this. Cobb ends up in a sort of limbo with one member of his team and he has to find him and bring him back out of the dream, which is the scene the film starts with. The film ends when Cobb see’s his kids again, but it ends on a cliff hanger and you have to decide whether you think it is the real world that he’s in, or if he is still in a dream. That’s a great ending, leaving every viewer in suspense, bubbling with the emotion and thrill of the film. I would recommend this film to anyone who loves good films, although it is more suitable for adults rather than children, because of the complexity. I would easily rate this as a 9/ 10 for it’s originality. I thought Inception was amazing because the storyline was brilliant! The movie is based around dreams and being able to steal information or plant an idea in someone’s subconscious, and to do so the person stealing things or the ‘extractor’ must get their target to sleep via special drugs. They then enter the person’s subconscious, sometimes having to plunge into a dream within a dream and then steal the information before they are discovered by being killed by the targets subconscious which fights against them. They plunge the target into a quadruple layered dream which is extremely risky because if they’re killed by the targets subconscious their mind gets stuck in limbo, leaving them mindless and mad back in the real world. One of my favorite parts is when they’re in the 2nd dream in a hotel and the gravity changes and they all begin to float because the van that they’re in in the previous dream drove off of a bridge and is spinning through the air falling towards the river below. The ending is brilliant because there’s four different climactic endings, one in each dream, which has an amazing effect. For once, this is one of those films where trailer not only doesn’t give you all the best bits from the movie, but in fact doesn’t even do it justice! This is actually a lot more than a movie with excellent special effects (and they are particularly good), it’s actually a clever movie that makes you think, and yet at the same time isn’t too “deep” that it’s out of grasp. The ideas presented are deep and complex, as opposed to just complicated and confusing, to the extent that Gemz & Sam both “got it” and enjoyed the movie far more than I was expecting them too because of that. DiCaprio’s portrayal of Cobb’s self torture and simple “messed up-ness” is really well done, and the other main actors don’t drop the ball, with quite a mix of characters and roles, which change across the different levels of “reality” they experience. It can get a bit tricky to keep up with the multiple “levels” of reality as the characters and the movie goes deeper, but then it all starts pulling together in a truly unusual way, effectively giving you numerous different climactic endings all converging at once! I was expecting to enjoy this movie, but came away having enjoyed it far more than I expected, so a real hit for me! This short video shows how to set up and configure the WPSyndicator social bookmarking syndication plugin, as well as the different ways in which it can be used. 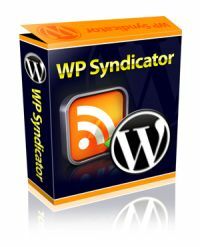 The Plugin can be set up to automatically syndicate your new blog posts to the 15 web2.0 sites as soon as you publish a new post. or you can go back and syndicate previous posts to any of the 15 sites at any time, giving you a great deal of control over how the system works. The most time consuming part of setting up the plugin is setting up new accounts with all 15 of the bookmarking sites it uses, as this can take 30-60 mins. But it only has to be done once, and from there on it’s the a breeze to use this simple plugin. Zero Cost Commissions is an affiliate marketing course with a difference, it’s from two guys who you probably haven’t ever heard of before, because they’re not “guru’s”, they’re real life affiliate marketers who do this for a living and make a killing at it! yup, that’s over 3 years! I make over half my income from niche affiliate sites, blogs and plr products. which I believe puts me in the “Do” category, so when I “teach” I’m teaching about what I’m doing to make money myself. Paul Liburd & Antonio Guiditta, the two “unknowns” behind the new Zero Cost Commissions system are the same, they “walk the walk”, and make big time profits just from affiliate marketing. In fact this is their first product launch in the “Internet Marketing” market. I only found about them simply because I bumped in to Paul at an internet marketing event earlier this year, I was outside having a smoke, as usual, and we just got chatting. So what kind of results do these guys get? They made $237,522 THIS MONTH from affiliate marketing. They can pull in up to $7,945 in a single day. These guys have been doing this for a couple of years and have really perfected their system, and that’s what this course is. So do you want to learn from someone who makes their money from teaching, or from someone who teaches HOW they make their money from affiliate marketing..? I am going to be putting together some bonuses to go with this, I’ve just not decided exactly what yet as I’ve only got hold of my own copy yesterday and I want to make sure the bonuses compliment the course and are useful for you to use WITH it. those who can, do… those who can’t..? Hi, I was once told a joke by a friend who was a teacher, it went something along the lines of: - Those who can, DO... Those who can't, teach... and those who can't teach, teach teachers! ** quicklink - http://mg.gd/a/zerocost ** please understand I don't mean any offense to teachers, the joke was told to me by a teacher after all, and I know quite a few teachers here in the UK, all of whom I respect, especially as they tend to be seriously underpaid considering what they do.. The point I want to use this to highlight is that this can be very true in Internet Marketing... there are many guru's who make the bulk of their money from selling courses and products teaching other people how to make money with affiliate marketing, even though it's not the core of their own business. personally, I haven't launched a paid (i.e. not free) product of my own (not including PLR products I've bought off others) since May 2007... yup, that's over 3 years! I make over half my income from niche affiliate sites, blogs and plr products. which I believe puts me in the Do category, so when I teach I'm teaching about what I'm doing to make money myself. So why am I telling you this..? Simples! there's a new course out today, it's literally just opened, that's from a couple of guys who are in the Do category BIG TIME!!! They made $237,522 THIS MONTH from affiliate marketing. http://mg.gd/a/zerocost not from selling their own products, but simply by promoting other peoples products. you won't have heard of them before, their names are Paul Liburd and Antonio Guiditta and they are the genuine article, highly successful underground affiliates. I found about them simply because I bumped in to Paul at an internet marketing event earlier this year, I was outside having a smoke, as usual, and we just got chatting. These guys bring in up to $7,945 per day and have been doing this for a couple of years, perfecting their system. the truly fantastic bit about their system is it takes: - ~ zero costs ~ zero experience ~ zero technical skill My point is do you want to learn from someone who makes their money from teaching, or from someone who teaches HOW they make their money from affiliate marketing..? yeah, easy decision... here's the link for you: - http://mg.gd/a/zerocost and yes, I am going to be putting together some bonuses to go with this, I've just nto decided exactly what yet as I've only just got hold of my own copy and I want to make sure the bonuses compliment the course and are useful for you to use WITH it. To make sure you get the bonuses, it's the usual process: - please MAKE SURE the affiliate ID shown at the bottom of the Secure Payment Form/Order Page says this: - [affiliate = confirm] If it doesn't then you will need to clear your cookies in your browser settings and then use the link above again Once you have successfully grabbed your copy follow these steps: - ~ 1. visit http://askmattg.com ~ 2. open a support ticket ~ 3. paste a copy of the receipt you get from ClickBank see you on the inside! note: My bonus will include a whole bunch of other places you can find excellent affiliate programs (other than clickbank) that they don't mention, including things like software. This is my own personal list of places that I use (and have built up over the last 10 years doing affiliate marketing) as they tend to have far less affiliates to compete with and can be a piece of cake to make money with because of that... Kind regards, Matt Garrett Support: AskMattG.com Feedback: blogtactics.com/feedback Twitter: twitter.com/mattgarrett/ Facebook: MattGarrett.com/facebook/ Blog: MattGarrett.com email: askmattg@gmail.com cruise: internetmarketerscruise.org Zero Cost Commissions: - http://mg.gd/a/zerocost All Content in this email is Copyright © Matt Garrett Ltd. and may not be republished in any format without express permission. Tell Us What You Think Of This Post: Comments Off on those who can, do… those who can’t..? I was thrilled to hear that Pixar were doing another Toy Story, so of course I just had to see it, and it took a bit of convincing to get my dad to take my brother and I to see it. I had heard great comments from friends about it and told dad, he checked out the film online and agreed to take us. I found that the film had a more modern animation of the cartoon than that of the original, so improved the quality of viewing. I was a bit upset to find that a few of the characters were not in this one, like Woody’s ‘girlfriend’ Bow Peep, but there were some great new characters in the film which soon made up for it. The film had that same action theme as the first two, but like the second had a sad undertone, because Andy is leaving for college which causes a spiral of events where the toys end up imprisoned at a day care centre. Near the end of the film, the toys end up on their way into an incinerator and think it’s the end for them, they all join hands in a pledge to go together, and it’s a very emotional moment in which I think nearly everyone in the cinema was close to tears. That’s not it, either, the toys manage to get back to Andy who bids a final farewell to them as he passes them on to a young girl, who is a lot like he was when he was younger. The scene is once again very emotional as he says goodbye to Woody and the gang and leaves for college. I would give this film an 8/ 10 because of the emotion in it. I enjoyed toy story because it was an action packed and heart warming ending to the trilogy where Andy has grown up and is off to college and the toys are either into the rubbish or into the attic. A terrible mix-up occurs while the toys are being moved to the attic and Andy’s mum mistakes them for rubbish, so they end up getting put outside in a binbag. Luckily they escape and end up getting taken to a daycare center which is ruled by a seemingly nice teddy bear. Woody decides to return to Andy and escapes, little does he know that his friends left in the daycare center would soon discover that the teddy bear in charge, Lotso, had a darker, more evil side. Meanwhile woody manages to find out that the daycare center isn’t a nice place for toys and he heads back to try and save his friends. the toys then have to battle their way out of many horrific ‘situations’ (including an incinerator) before eventually getting home to Andy. Every thing ends well as the daycare center is turned into a nice place for toys and Andy gives his childhood companions to a delighted new owner. To be honest I think it would have been a more interesting ending if they’d been killed in the incinerator! lol! To be fair, I checked out the reviews for the movie and it sounded like it was probably going to be a better movie to watch than the A-Team, with some pretty impressive reviews. Some of the reviews would have us believe it’s the best Toy Story yet, but I disagree, it is very good, as all of them are, but I wouldn’t put it above the previous ones. The theme of the movie is very much in the style of a World War 2 Prison Escape movie, which did make for some great “action” funny moments, although I think I laughed most at some of the Barbie & Ken moments and the mad Monkey. The toys all finding a new home at the end was a nice touch too, although I’m kinda with Sam on the idea that they could have just ended it in the incinerator! Hi, apologies for mailing again today, but I've had quite a few people email me to say that they can't find the 3 free list building videos on the order page for Bill's Never Fail Listbuilding system, so I just wanted to explain where to find them... note: if you've already managed to find (and watch) them, they're not that well hidden after all, then please hit delete and my apologies for disturbing you again today! ;-) step 1. go here: - http://mg.gd/a/nflb step 2. scroll down the page and check out the three links at the bottom: - #1 = List Building Lies #2 = Plug N Play Listbuilding #3 = Bigger Than Google as I mentioned earlier, I've got a copy of this myself and I've not gone through it all yet, but I can already see that it's a REAL, long term, large scale automated list building system. in fact I do something similar myself, simply not as well organized or systemized as what Bill has put together! Bill's throwing in a whole year of coaching with the system, but it's likely to be sold out in the next day or so... http://mg.gd/a/nflb even if you're not going to pick up the system for yourself, the 3 free videos are worth a quick gander! :) Kind regards, Matt Garrett Support: AskMattG.com Feedback: blogtactics.com/feedback Twitter: twitter.com/mattgarrett/ Facebook: MattGarrett.com/facebook/ Blog: MattGarrett.com email: askmattg@gmail.com cruise: internetmarketerscruise.org Automated Listbuilding System ~> http://mg.gd/a/nflb All Content in this email is Copyright © Matt Garrett Ltd. and may not be republished in any format without express permission. Hi, I only got hold of a copy of this myself a few days ago and I've been spending time with my kid this weekend so not yet had chance to go through the whole thing yet, but... watch the 3 free videos here ~> http://mg.gd/a/nflb the videos I have watched so far make it pretty clear to me how the system works and just how it works so well! This is real long term, large scale automated list building!! It's not some push button system, you will have to put a bit of work in, and how often do those push button systems work for more than 5 minutes, if at all..? It doesn't require a lot of financial investment (it's not buying traffic of any sort), it just needs a bit of time, which you can outsource to speed things up if you prefer.. This is the kind of system that once you've put the work in it will go on and on building your list for months and months, if not years and years to come... And to help bring it all together for you, Bill's throwing in a whole year of coaching with the system. I've known Bill for a couple of years now, I even met up with him on the Marketers Cruise earlier this year, so I can vouch for him being a guy who knows how to deliver, and on this one he's actually over delivering! This is going to be sold out soon, so please go take a look at the free videos (at the bottom of the page) today, before they're gone: - ~> http://mg.gd/a/nflb Kind regards, Matt Garrett Support: AskMattG.com Feedback: blogtactics.com/feedback Twitter: twitter.com/mattgarrett/ Facebook: MattGarrett.com/facebook/ Blog: MattGarrett.com email: askmattg@gmail.com cruise: internetmarketerscruise.org Automated List building System ~> http://mg.gd/a/nflb All Content in this email is Copyright © Matt Garrett Ltd. and may not be republished in any format without express permission. I found that the beginning of The Last Airbender wasn’t great, as the film is based on the animated DVD series called the Avatar which is in three books, each book having about 20 episodes. At the beginning of the film it misses out a lot of information which is shown in the animated series, of course anyone who hasn’t watched the animated version wouldn’t notice, but it does make the film is slightly ‘jumpy’, so doesn’t make total sense, which just looks like a bad film. The actors also don’t seem very good at acting when the film first starts. However, as the film goes on it improves in both areas greatly. The main character is named Aang, and it is up to Aang, with the help of his two friends, Katara and Sokka, to save the world. Of course he has a lot of work to do in order to be able to save the world. The special effects throughout the film are brilliant, and are some of the best I’ve seen, making it one of the best 3D films this year. This was only the first book, and I can’t wait to see the second and third when they come out if they are as good as this one. I would give this film a 7/ 10 mainly because of the graphics. I really enjoyed avatar because the special effects were amazing! The movie is based around the cartoon series which i’ve watched, so i understood what was going on in it a lot better, but you can easily watch it without even knowing about the series and still understand the storyline well. The movie covers the first of three series from the cartoon and if they create movies for the other two that are even half as good I’ll be very keen to see them. In the movie there are four nations: earth, fire, air and water, who each have special people among them who can bend their nations element to their will, but there is one person who can control all of the elements, the avatar. In the time the movie is set in the fire nation is at war with the other nations and has already wiped out the air nomads. Aang, the hero of the movie, is the current avatar and the last air bender left. He has been missing for nearly 100 years, until Katara and her brother Sokka, members of the southern water tribe, find Aang and together they begin a revolution to stop the fire nation from defeating the remaining two nations. There is a climactic and epic ending at the northern water tribe’s fortress, where they manage to defeat the fire nation against overwhelming odds, which has some wicked special effects! The first, and surprisingly only major, problem I had with the movie was the somewhat out of place casting of the three main characters as caucasians rather than asians as pretty much the rest of the cast, it appears to be a classic “hollywoodization” of the film, most likely in an attempt to appeal specifically to the western/US market. Once past that the movie itself was pleasantly enjoyable, although that was possibly because I went in with such low expectations it was difficult for it to disappoint. The plot is fairly simple, but then it is based on a kids cartoon, and the dialogue likewise lacks any real sparkle or bit, for probably the same reason. The acting wasn’t exactly award winning, but I’ve seen worse from supposedly better actors, rather than kids… Dev from Slumdog Millionaire did a failry good turn as a “baddy”. Hi, Today's your last chance to lock in the bonuses and make sure you can get your own copy of the traffic 'glitch software that made $4,191 in the first 7 days it was used... you can watch the video here: - ~> http://mg.gd/a/trafficavalanche or read my full blog post about it here: - http://iamuncovered.com/traffic-generation-software/ remember you DON'T need any of these to get started with this: - You don't need a website You don't need a product You don't need any experience You don't need to be a salesperson You don't need to be an expert in any niche You don't need to spend hours setting things up You don't need any technical knowledge You don't need to spend oodles on advertising You don't need to know about SEO, Link Building, Twitter, CPA networks, PPV, Media buying or Blogging You don't even need social bookmarking, adswaps, classified ads, solo ads, article marketing or JV partners and affiliates And you DON'T need Google! (phew!) ~> http://mg.gd/a/trafficavalanche AND here's details of the bonuses that are up for grabs... BONUS 1 - A case study of a profitable ATA campaign which you can COPY and profit from. This campaign generated Mike over $500 in the past 10 days... Now you can have it too. BONUS 2 - Secret (only ATA members can find out what this is!) Marketing Extreme eBook. Harness the extreme marketing power of (SECRET) to make massive online profits. IMPORTANT: To make sure you can claim your bonus, please MAKE SURE the affiliate ID shown at the bottom of the Secure Payment Form/Order Page says this: - [affiliate = launchdom] If it doesn't then you will need to clear your cookies in your browser settings and then use the link above again Once you have successfully grabbed your copy simply forward your Clickbank receipt to loveprofitx@googlemail.com with the title CHRIS TONY BONUS here's the link again ~> http://mg.gd/a/trafficavalanche Kind regards, Matt Garrett Support: AskMattG.com Feedback: blogtactics.com/feedback Twitter: twitter.com/mattgarrett/ Facebook: MattGarrett.com/facebook/ Blog: MattGarrett.com email: askmattg@gmail.com p.s. Secret Traffic Source and Software: - ~> http://mg.gd/a/trafficavalanche All Content in this email is Copyright © Matt Garrett Ltd. and may not be republished in any format without express permission.